The United States Mint in nine months this year has already struck more coins for circulation than in any year since 2007. Over 1.47 billion in pennies, nickels, dimes and quarters came out of U.S. Mint coining presses in September, lifting the production total for 2015 so far to over 13.3 billion coins. The agency this year is on track to strike more coins than in any year since 2001. Pennies cost more to make and distribute at about 1.7 cents than they’re worth, yet the Federal Reserve always orders more of them from the United States Mint than any other denomination. In September, the Mint struck 833.3 million Lincoln cents, or about 56.4% of the circulating-quality coins produced for the month. The percentage is a tad higher than typical months. 6.4% more America the Beautiful Quarters. Presidential $1 Coins, Native American $1 Coins and Kennedy half-dollars are no longer ordered by Federal Reserve Banks but the United States Mint continues to make them in circulating-quality for coin collectors. U.S. circulating coin production facilities are in Denver and Philadelphia. Last month, the Denver Mint produced 819.58 million coins and the Philadelphia Mint made 656.79 million coins. For the January through September period, the Denver Mint struck over 6.8 billion coins and the Philadelphia Mint made almost 6.5 billion coins for a combined output of 13,335,540,000. That’s a 29.8% increase over the 10,277,360,000 coins minted through the same months in 2014, and the most for a year since the 14.4 billion coins in 2007. Last year’s 12-month total reached just over 13.28 billion coins. This next table lists year-to-date coin totals by denomination. The U.S. Mint is averaging a monthly production run of nearly 1.49 billion coins. 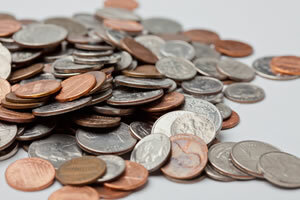 Stretched through 12 months, the agency is on pace to make 17.78 billion coins this year. Such a level has not been seen since 2001 when over 19.4 billion coins were produced. In dollar designs, Denver Mint figures for John F. Kennedy Presidential $1 Coins climbed by 140,000. The U.S. Mint started selling rolls, bags and boxes of them back on June. 18. With 11.48 million in total, there are more JFK dollars than any in the series since the second term Grover Cleveland Presidential $1 Coins launched in late 2012. There is one difference when subtracting coin totals by design from those by denomination — mintages of America the Beautiful Quarters are higher by 393.22 million. These are a portion of the Bombay Hook quarters for Delaware. The United States Mint started selling bags and rolls of the coins on Sept. 30. The Mint will continue to make Bombay Hook quarters through October. The agency is also likely already striking Saratoga National Historical quarters in preparation for their mid-November release.